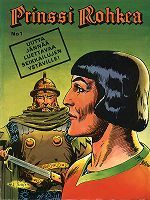 Prinssi Rohkea, as our Prince is called in Finish, is printed by Semic Press in Finland. 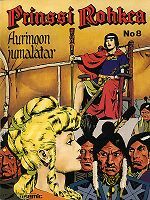 They did publish 9 volumes. Each book has 47 or 48 pages. Printed between 1976-1978. Colour, new (poor) colouring. This series follows quite nicely the original page format. 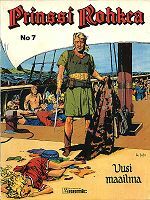 Some reorganizing were done in volumes 4 and 5 which includes the post-war prince valiant strips. Prices vary between 10 and 25 euros. These are however very difficult to find in great condition. 1: The Sea King 1976 (Fin: Angor Wrack; title mentioned only in the inside pages) / Semic. Sunday pages 9.3.1941 - 4.1.1942. Compiling original pages 213 – 256. 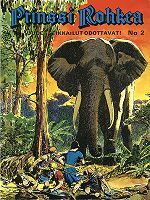 2: Journey to Africa 1976 (Fi: Afrikka; title mentioned only in the inside pages) / Semic. 11.1.1942 - 25.10.1942. Compiling original pages 257 – 298. 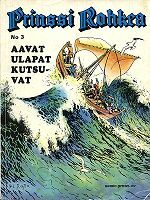 3: Aavat ulapat kutsuvat (Fin: Aavat ulapat kutsuvat) 1976 / Semic. 1.11.1942 - 12.9.1943. Compiling original pages 299 – 344**. 5: Aleta 1977 (Fin: Aleta)/ Semic. ?. ?.1944 - 25.11.1945. Compiling original pages 394 – 434, # , # , 437 – 443, # , # , 446 – 455, * , 459. 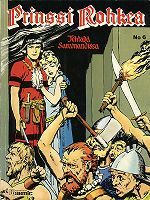 6: Intrigues at Camelot 1977 (Fin: Tehtävä Saramandissa)/ Semic. 2.12.1945 - 13.10.1946. Compiling original pages 460 – 505. 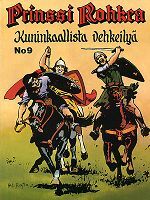 7: The New World 1978 (Fin: Uusi maailma)/ Semic. 20.10.1946 - 31.8.1947. Compiling original pages 506 – 551. 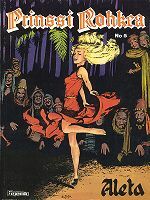 8: The Sun Goddess 1978 (Fin: Auringon Jumalatar)/ Semic. 7.9.1947 - 4.7.1948 ??? Compiling original pages 552 – 595. * Refers to a comic book page which cannot be counted as a whole Sunday page. ** From the original page 336 (page 40 in the book) onwards the title text location was changed to the first panel but this title text is not reproduced in the book. 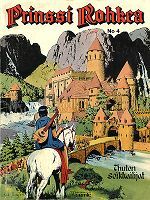 *** 376 (page 34 in the book) onwards the original page format was changed and Foster created a new additional strip for the page; The Medieval Castle. In these reprint books this series is not reproduced. Because of this all the corresponding pages (’till the end of book 5) contains 1,5 original Prince Valiatn Sunday pages. # These additional pages are compilations of different panels from many separate pages. Serie 1; Semic in Finish.